As I’ve told you before, on Saturday mornings, I go to the Charlottesville City Market. Since April, these market visits have also been coffee dates with Sarah. We gab about recipes we have created recently and our ever-evolving life plans as we seek out our favorite vendors and discover new ones. A few weeks ago, when neither of us needed to be buying anything else, we saw the most beautiful potatoes at a little produce stand that I remember purchasing from in years past–they proudly display a plaque that identifies them as one of the oldest vendors at our market. A young man was behind the table, while an older man, with one of the most thick southern accents I have come across in recent memory, stood next to the table, chatting with customers as they stopped to check out his veggies. As Sarah and I discussed the lovely potatoes before us, the old farmer not only convinced us each to buy some, but he threw in extras as a bonus! My bonus was two small, white sweet potatoes. 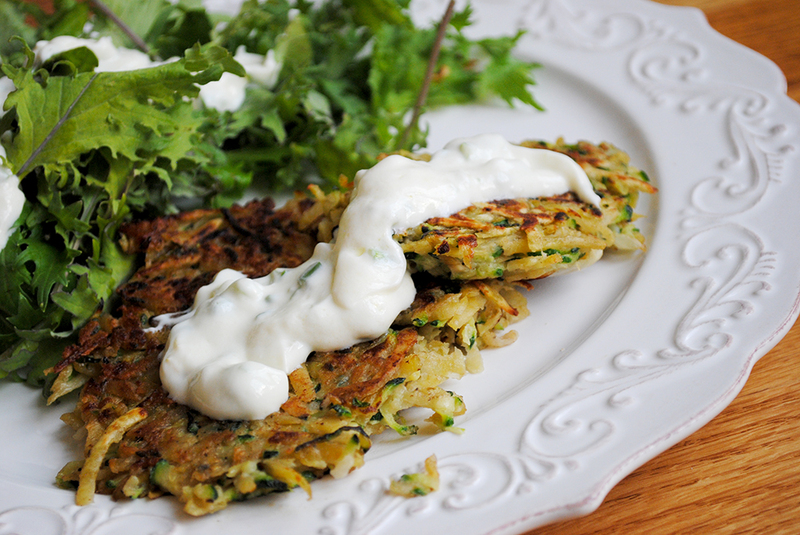 I quickly decided exactly what to do with the potatoes– combine them with the zucchini I had at home to make zucchini/potato fritters. And so, as usual, I did a bit of research to see exactly how one creates the fritters I had in mind. 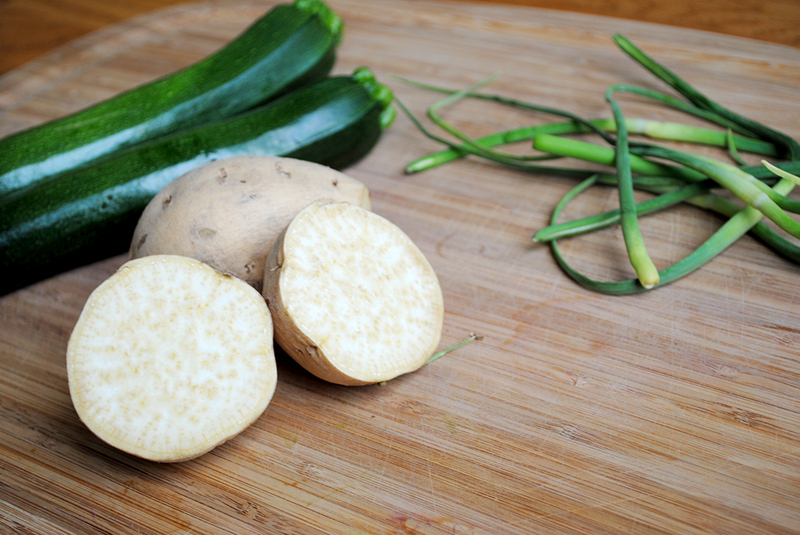 I looked for both zucchini recipes and potato recipes, and found inspiration from Smitten Kitchen and Sprouted Kitchen, two blogs I read regularly. As more and more time passes since I first began to read blogs, I realize that these women are becoming my “friends”–even those with whom I have never spoken. I know little bits about their lives, the precious moments they share with the world, and I learn about them through the recipes they create. As I read their posts, study their recipes, and make them my own, it’s like I am in the kitchen with a good friend. I only wish I could be in the kitchen with these women, sipping tea and learning from them, playing the role of sous chef, or just watching them work. For now, I’ll have to settle for cooking their recipes–or my variations on them. Coarsely shred the vegetables in a food processor. Toss with the salt, and let sit for 10 minutes before straining through cheesecloth (or paper towels) to squeeze out excess water. Combine the vegetables with the egg, flour, and pepper. Melt a generous amount of coconut oil and butter in a cast iron skillet over medium-high heat. Scoop about 2 Tablespoons of the mixture for each patty. 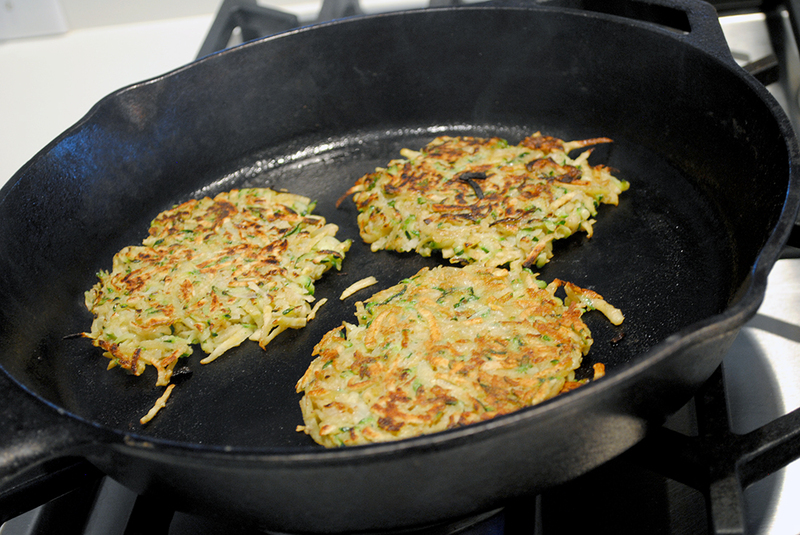 Press patties flat in the pan and cook about 3 – 4 minutes per side. Drain on a paper towel-lined plate. Keep warm and crisp in a 200 degree oven until ready to serve. For the yogurt sauce, combine all ingredients in a small bowl. Dollop generously over top the fritters. 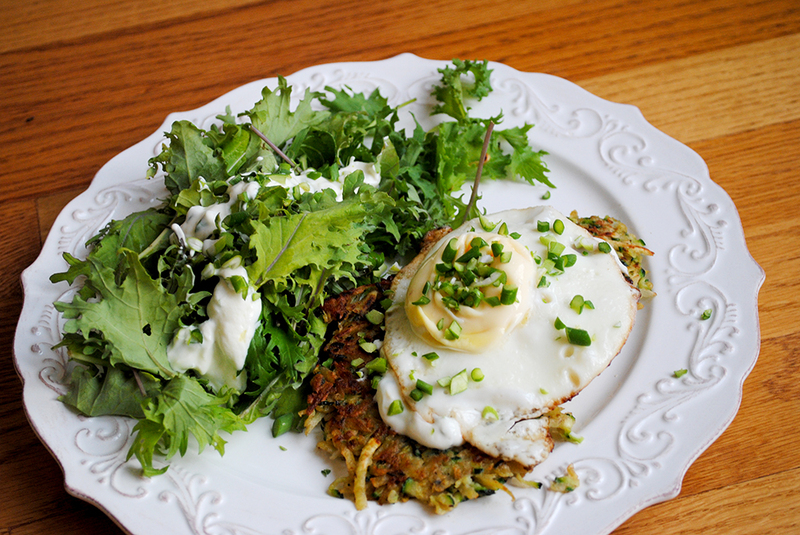 I took Sara‘s advice and served my fritters with greens on the side and a fried egg on top. It was a perfectly delicious weeknight dinner, and would make a pretty terrific Sunday brunch, too. Hope you enjoy these as much as I did.